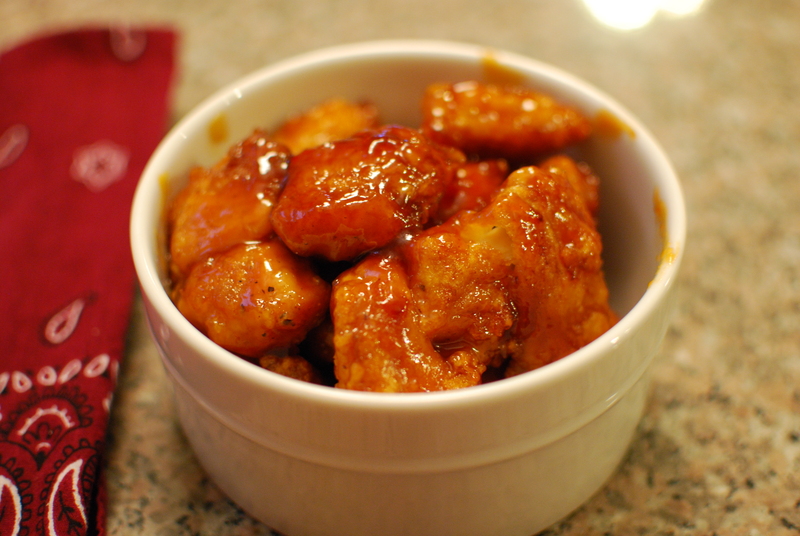 OMG this baked honey chicken is sooooo good!!!!!!! Like serve to company good. Like tastes better than takeout good. Everyone loves it! 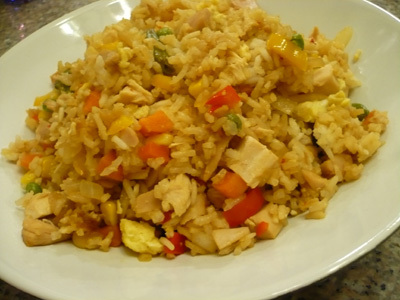 Serve with hot rice or with Fried Rice. Preheat oven to 325*. Cut chicken breasts into bite-sized pieces and season with salt and pepper. In 2 separate bowls, place cornstarch and slightly beaten eggs. Dip chicken into cornstarch then coat in egg mixture. Heat oil in a large skillet over medium-high heat and cook chicken until browned. Place the chicken in a 9 x 13 greased baking dish. In a medium sized mixing bowl, combine honey, soy sauce, ketchup, brown sugar, rice wine vinegar, sesame oil, minced garlic, and cornstarch. Pour over chicken and bake for 45 minutes or until chicken is cooked through. I really love Asian food. When we go out for Asian food, we always go to a Thai restaurant…Thai is my absolute favorite! The only Chinese restaurant I like is one little joint in Baton Rouge, LA, which has national acclaim. 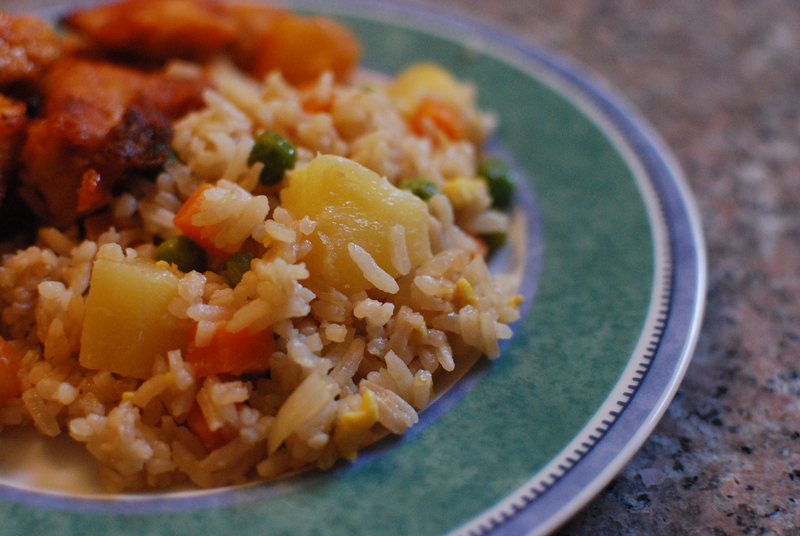 All other Chinese restaurants scare me–either the smell of the restaurant turns me off, or the food is just not good. But because I love Asian cuisine, to get my fix, I make it at home. This is one of our old standbys and I love it! The blended sauce works great as a dipping sauce for fresh (not fried) Thai spring rolls too–I should make these some day soon, because they are delicious. Cook linguine according to package in salted boiling water. When cooked, drain and run cold water over the noodles until all noodles are cold. Meanwhile, heat the sesame oil over medium high heat in a nonstick skillet, and saute the chicken until done. In a blender add ginger, garlic, pepper flakes, lime juice, brown sugar, peanut butter, vinegar, soy sauce, and hot water; blend until everything is combined and a thick sauce forms. 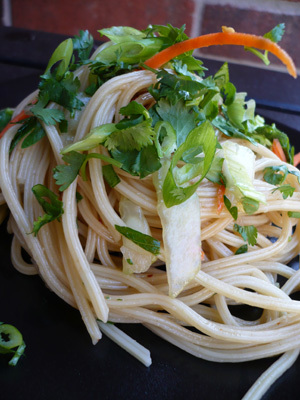 Place cold linguine in a large bowl, add the red pepper slices, carrots, cilantro, green onions, and chicken. Pour sauce over and combine. 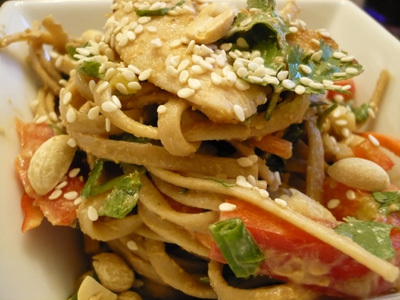 Garnish with sesame seeds and peanuts. This recipe comes from Wolfgang Puck’s Pizza, Pasta, and More! cookbook. It makes for a great light dinner or side dish. You can easily make this the main event by adding chicken, beef, or tofu. One of my favorite Thai dishes is the fresh spring roll. Not the deep fried ones, but the ones in rice paper, that have rice noodles and veggies in them. This dish reminds me of an inside out fresh Thai spring roll. This dish was really good the first night we had it, then the next day for lunch we had it and it was excellent. It really benefited from overnight refrigeration. So definitely plan to make this one ahead of time. We tried it first without the fresh lime juice (honestly because I forgot to put the limes on the table) and it was good, but the fresh lime juice really brightens the flavor…so don’t forget the limes! We’ll definitely make this one again. 1 TBSP plus 1 tsp chili and garlic oil. Instead of making Puck’s chili and garlic oil, I just used oil, and added crushed red pepper and minced 2 garlic cloves. 12 oz angel-hair pasta, allowed to dry after cooking. Puck says lay it out on a flat pan so noodles retain shape and don’t stick. I couldn’t accomplish this, so I went ahead and mixed the salad together then refrigerated. Make the dressing: In a small bowl, whisk together the sugar, soy sauce, vinegar, and oil. Set aside. When pasta is dry, place it in a large bowl and pour the dressing over. Toss to combine and let rest 1 or 2 minutes so that the dressing is absorbed. Add the remaining ingredients, reserving a few peanuts, scallions, and cilantro for garnish, and gently toss to combine. My advice: Don’t bother waiting for the pasta to dry, just combine everything and refrigerate. I’d refrigerate for as long as possible before serving. To serve, garnish with peanuts, scallions, cilantro and lime wedges.